• Know your blood pressure. Years of high blood pressure can lead to heart disease. People with high blood pressure often have no symptoms, so have your blood pressure checked every 1 to 2 years and get treatment if you need it. Ask your doctor or nurse for help. • Get tested for diabetes. People with diabetes have high blood glucose (often called blood sugar). People with high blood glucose often have no symptoms, so have your blood glucose checked regularly. Having diabetes raises your chances of getting heart disease. If you have diabetes, your doctor will decide if you need diabetes pills or insulin shots. Your doctor can also help you make a healthy eating and exercise plan. • Get your cholesterol and triglyceride levels tested. High blood cholesterol can clog your arteries and keep your heart from getting the blood it needs. This can cause a heart attack. 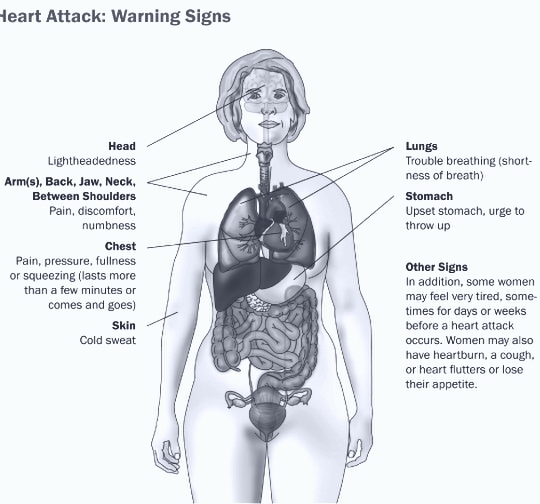 are linked to heart disease in some people. People with high blood cholesterol or high blood triglycerides often have no symptoms, so have both levels checked regularly. If your levels are high, talk to your doctor about what you can do to lower them. You may be able to lower your both levels by eating better and exercising more. Your doctor may prescribe medication to help lower your cholesterol. «» Start by adding more fruits, vegetables, and whole grains to your diet. «» Each week, aim to get at least 2 hours and 30 minutes of moderate physical activity, 1 hour and 15 minutes of vigorous physical activity, or a combination of moderate and vigorous activity. • If you drink alcohol, limit it to no more than one drink (one 12 ounce beer, one 5 ounce glass of wine, or one 1.5 ounce shot of hard liquor) a day. • Find healthy ways to cope with stress. Lower your stress level by talking to your friends, exercising, or writing in a journal.